This is the story of a religious community in crisis. 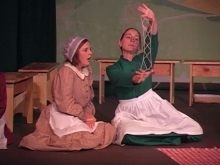 Set in 1838, As It is in Heaven explores issues of faith through the eyes of nine women in the Shaker village of Pleasant Hill, Kentucky. When a newcomer to the community begins experiencing visions, the older members, who have seen none, begin to question their own devotion to the Way. 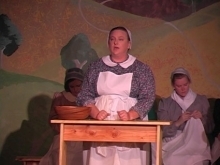 Alternately dramatic and comic, the play reflects the simplicity of the lifestyle it depicts, and is punctuated by Shaker songs sung a cappella. 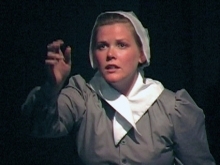 The play is based on actual events from the Era of Manifestations - a time of heightened divinity and unusual behavior that began in the late 1830s with reports of a group of young Shaker girls who became absorbed in unusual trancelike activities, communication with angels and descriptive journeys to heavenly places. The show's premiere was hailed by The Herald as "...powerful and insightful...a thought-provoking piece, the message being that often we need not look as far as heaven to see angels here on earth." As It is in Heaven will be performed Fridays and Saturdays, October 23rd through November 21st, with an extra performance on Thursday, November 19th. All performances begin at 8:00 pm.